Recommending a potential hepatotoxin as a liver “detox” is pretty irresponsible. 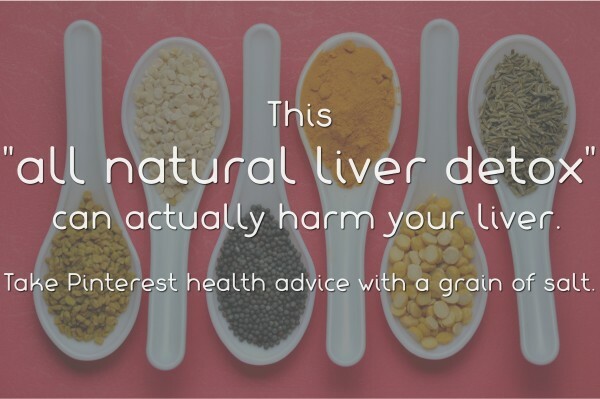 Your liver doesn’t need to be “detoxed”, anyway. It’s what removes toxins from your body. Trying to “detox” it is like trying to recycle your recycling bin. It’s at best pointless, and at worst it leaves you with nothing to take out your recycling in. You don’t need to do a cleanse to rid your body of toxins. That’s what you’ve got a liver for! It’s even all-natural and possibly organic, depending on how crunchy you are. Anyone telling you about a miracle cure that’s all benefits and no side effects is probably trying to sell you something. If you find yourself taking advice from Dr. Pinterest on how to heal your abused liver, it’s time to stop, take stock of your life and stop abusing your liver so much.